These products were sent courtesy of L'Oreal Paris. All opinions expressed below are my own and I was not compensated in any way. 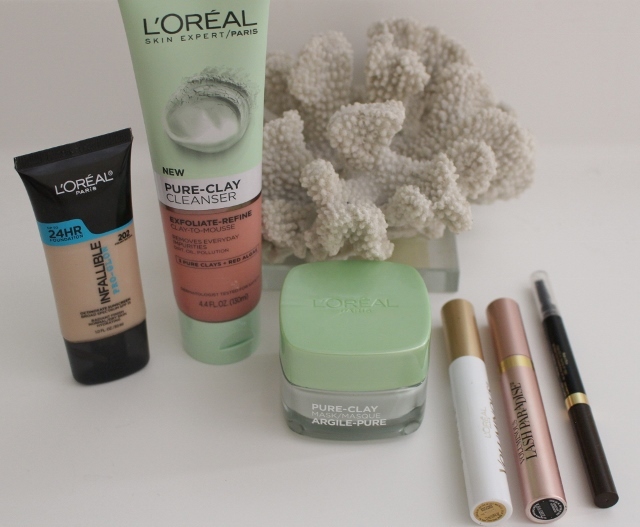 As most of you may know, L'Oreal was generous enough to gift me with a PR package a few months back that included their newest products of 2017. I've been playing around and testing them since, and these are the stand-outs that I will (and have) purchased with my own money. Read on for my thoughts! 1) Infallible Pro-Glow 24 hour foundation: This light-weight foundation matches my skin to a T. I've always been reluctant to buy drugstore foundation because the color match is usually all wrong, and the formulation can be hit or miss. This foundation is probably best suited for drier skin, as it definitely promotes a dewy appearance. It's very watery in consistency, but it's also buildable. I shake mine before applying it with a damp beauty blender. My skin looks instantly more radiant, as well as moisturized. In fact, because it has SPF 15, I think it's perfect as a tinted moisturizer. 3) Pure-Clay Mask: This is a great mask for getting rid of blackheads and other blemishes. It also banishes oil. Feels and smells amazing on and then rinses to a squeaky clean. 5) Lash Paradise: You can read my thoughts in this post. One thing to note that I didn't mention - although I love this mascara for its volumizing and lengthening effect, I had to purchase another one because it dried up too quickly. That's the only downside. Otherwise, it's the only mascara I'm wearing and I don't plan on changing that. If I do, I'll let you know. 6) Brow Stylist Shape & Fill: I can't rave enough about this! I've used brow pencils in the past from different brands, but I wasn't crazy about any of them. What I love about this pencil is that it has an angled tip which allows for precise control. I just sweep it on the sparse areas where I need color the most. The spoolie on the other end of the pencil is an actual brush, not some plastic wand that barely does anything. Brush hairs, apply the product, then brush again. It lasts all day. I love the entire Infallible foundation line! My current favorite is the Total Cover. It's a nice inbetween of the pro glow and the matte! That sounds perfect for a lot of people Laura, hopefully they read your comment! Excellent reviews! You're making me want to try all of these. That cleanser sounds amazing! And I've been using the same brow pencil for years but I might have to test out this one! Thanks Gina! The cleanser feels so good. I've never used a clay cleanser before trying these and now I've been seeing other brands making them. Definitely try the brow pencil! I own the primer but still have to test it out - sounds like it's amazing!